Autism Speaks doesn’t speak for autistics. Real live autistic people and their loved ones have known that for some time. But they may have finally crossed the line with their hateful, fear-mongering, ableist rhetoric. On November 11, AS co-founder Suzanne Wright issued a public statement about the organization’s policy “summit” in Washington DC. She compares autism to kidnapping and grave illness, and says that families suffer in constant despair and misery, with their silent, absent children. She calls for the formulation of a “national plan” to respond to the emergency of autism. The problem is, nothing she says is true. Certainly her numbers are off. Wright deploys erroneous statistics designed to inflame fears of an epidemic that play into AS’s definition of autism as a tragic disease to be cured. There are not 3 million autistics in America today; this grossly inflated statistic comes from applying the CDC’s current incidence rate of 1 in 88 children across the entire American population, rather than the average prevalence of 1 percent. And since autism varies broadly as a condition, the average cost of lifetime care which Wright cites as $2.3 million per autistic person is also wildly out of line—the average cost of raising any American child from birth to age 18 stands at $241,080 in 2013. Worse than the factual errors, though, is the continuation of Autism Speaks’ pattern of silencing and erasure of the autistic people they supposedly want to help. AS has never had an autistic person on its board or in its leadership, and their use of harmful stereotypes and blatant devaluation of autistic lives for fundraising are well documented. To add the voice of a real live autistic adult would damage the profitable image of the helpless, silent, stricken child. And profit really sits at the center of what Autism Speaks gets from the terror and misinformation they spread about autism. 52 percent of the money AS raises goes right back into fundraising and exploitative “awareness” advertising. Fully 5 percent of their annual income in 2010 went into administrative costs and salaries, with some executives making over $400,000 a year. Almost all of the 44 percent they spent on research was devoted to efforts to develop a pre-natal test and a “cure” for autism. 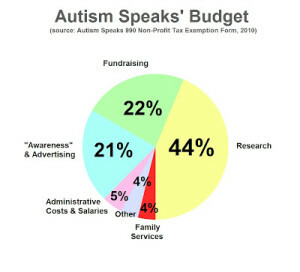 Only 4 percent of the $50.2 million raised in 2010 went to support autistics and their families. In its response to Wright’s outrageous rhetoric, Autistic Self-Advocacy Network calls once again for a place for autistic adults at any public policy table. Already, the group has made groundbreaking strides in this area, with the Presidential appointment of its founder Ari Ne’eman to the National Council on Disability. It’s surely just a coincidence that Autism Speaks timed its “summit” for the same week as the Autistic Self-Advocacy Network’s annual gala affair in Washington DC. ASAN plans to shift the party downtown, to a protest Wednesday at George Washington University, where the AS event is taking place. Perhaps Autism Speaks will finally be forced to shut up and listen. Jessica Banks (@ProfBanks) is an educator, historian, activist, wife, and autistic mom of two sons. She works in the tabletop game industry and blogs at profbanks.com. but three million people actually IS one percent of the (approx.) U.S. population of 300 million, if the prevalence rate really is this percentage. Maybe I’ve read this incorrectly (or something). In any case, you are otherwise spot on about that awful organisation known as Autism Speaks, an organisation that actually speaks for their perceived target audience of ‘poor, stressed parents who are burdened with children who aren’t normal’ (in their warped view). They try to present bigotry with a respectable face, and if they had their way autism (and Asperger’s) would be ‘eliminated’. Hmmnn, now where have I heard THAT message before?